1. Preheat the oven to 180°C, gas mark 4 and cook the haggis according to pack instructions. 3. Place the potatoes (tatties) in a pan and cover with cold water. Bring to the boil and simmer for 12-15 minutes until tender. Drain, and allow to dry in the pan for 2-3 minutes, then mash. Warm the milk and half the butter in a pan until the butter has melted. Stir into the potato and season. 4. Place the swede (neeps) in a pan and cover with cold water. Bring to the boil and simmer for 15 minutes until tender. Drain and return to the pan to dry out for 2-3 minutes. Mash, stir in the remaining butter and season. 5. Reheat the gravy, neeps and tatties if necessary. Remove the haggis from the oven. Make a slit through the casing and pour in the whisky. 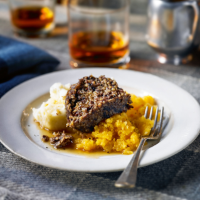 Serve spoonfuls of haggis with the tatties, neeps and gravy. This recipe was first published in Thu Jan 22 14:52:03 GMT 2015.